Hair-raising bends and breathtaking views: fifty kilometers you'll never forget! Undoubtedly one of the most stunning stretches of the Italian coastline, the 50kms which divide Positano from Vietri sul Mare take us through a dramatically beautiful landscape characterized by great cliffs diving down in to a magnificent blue sea, clusters of white houses clinging perilously to the rock face; and terraces brimming with brightly colored flowers. 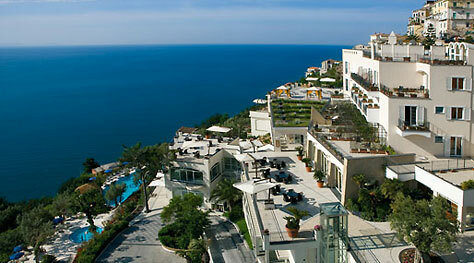 The panoramic SS163 highway links all of the towns situated along the Amalfi Coast. Also known as the Nastro Azzurro or Blue Ribbon, the road is much loved by motorcyclists who revel in the chance to experience the thrill of its succession of hairpin bends. We make our first stop at Positano , arguably one of most enchanting and romantic places in the world, and a famous tourist destination since Roman times. 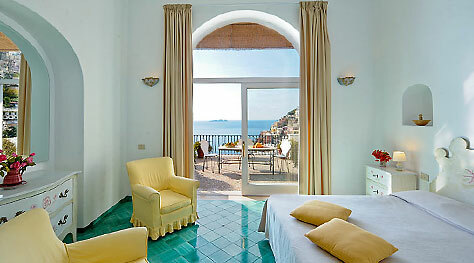 Positano has all the typical characteristics of the towns of the Amalfi Coast: the historic center being located in the higher part of the town, linked to the harbor and the beaches by an infinite series of steps and steep winding roads. The town's main beaches are those of Spiaggia Grande and Fornillo, both accessible by foot. 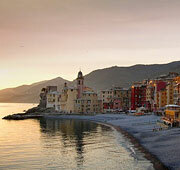 Visitors wishing to reach the beaches of La Porta, Arienzo and San Pietro Laurito will need to take a boat. During the middle ages numerous watch towers were built in the area so as to guard against attack by the Saracens, frequent perpetrators of violent assaults on the coastal populations. 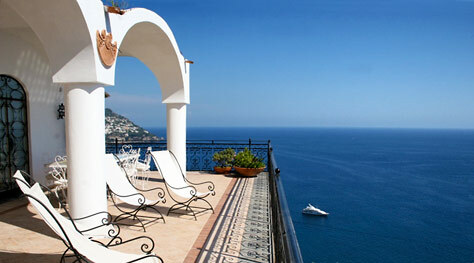 One such tower can be found just outside the town of Positano, in Punta Campanella. Nineteen kilometers from Positano lie Praiano, Plagianum for the Romans, and which, in the era of the Marine Republics, came under the rule of nearby Amalfi. It may be less famous than its once omnipotent neighbor, but Praiano, which hosts a series of important traditional festivals and cultural events each year, is just as beautiful. A procession of attractive little white houses lines the road leading from Praiano to the small towns of Furore and Conca dei Marini. The earliest mention of Furore dates back to 1752. The town, situated on extremely impervious terrain, is known for its cuisine which uses the local tomatoes, olive oil, potatoes and mountain herbs to great effect. 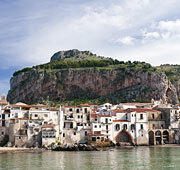 Just beyond Furore, we come to Conca dei Marini, a fishing village known above all for the Grotta dello Smeraldo. The cave offers an impressive display of stalactites and stalagmites which, in certain places join so as to form columns as many as ten meters high. 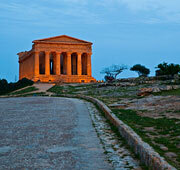 The Grotta can be reached by boat or accessed from the SS163 highway via a flight of steps of a lift. Travelling onwards along the Nastro Azzuro, after just a few kilometers we come to the historic town of Amalfi which, in 1997, was awarded the status of World Heritage Site by UNESCO. Undisputed ruler of the seas in the 12th century, the town's gradual decline from power has in no way diminished the beauty of its historic monuments, monuments such as the cathedral: a veritable gothic masterpiece complete with highly decorative façade and impressive flight of steps. The immense cathedral doors, made in bronze, were realised in Constantinople in 1065. Whilst wandering through the picturesque lanes of Amalfi, lined with tiny white cottages and shops, it is easy to catch a scent of the "sfusato" lemons which grow in abundance on this stretch of coast and are used to make the area's highly prized limoncello liquor. From Amalfi we take the provincial highway which leads to Ravello, town built above those of Maiori and Minori, on a high plain of the Dragone Valley. Breathtaking views of the Gulf of Salerno can be admired from the terraces of the elegant villas for which the town is famous, villas once chosen as preferred residence of many a famous personage, from J.F.Kennedy to Roberto Rosellini, from Federico Fellini to Winston Chruchill. 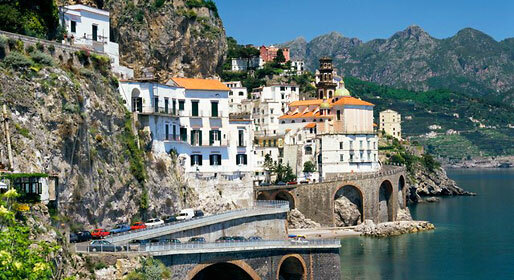 Once again on the SS163, after Minori and Maiori we come to the last town of the Amalfi Coast. 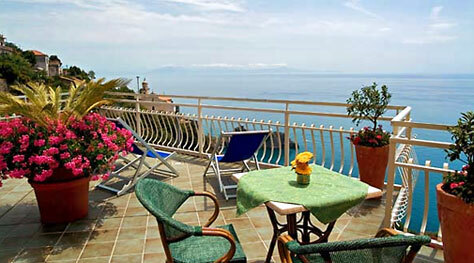 Vietri sul Mare, built in one of the most sheltered areas of the gulf of Salerno, is a town of Etruscan origin. A popular seaside holiday destination, Vietri sul Mare is perhaps most famous for its ceramics, displayed in the numerous workshops which line the streets of the town.